Offbeat Careers: Get Published! It's easy! Home Weekly Wits Offbeat Offbeat careers: Get Published! It’s Easy! Offbeat careers: Get Published! It’s Easy! People say getting published is a long frustrating dream. Maybe it was once, but in today’s world, with all the new technologies and innovations, it isn’t as scary as it used to be. If one goes step by step and climbs the ladder gradually, it is actually very simple. The foremost point is of course, writing a best seller. One can start with a simple blog or keep a journal. That way, writing prose or poetry becomes a habit which eventually leads up to the desire of getting published. Bloggers have an edge over the diary writers for they can get opinions from others too. Now days, microblogging on social media sites like Twitter has become a trend too. Moving on from free expression and no bars, getting published is quite a different scene. Impressing a certain publisher seems quite a task. Freelancing for various online magazines like 21 Fools or Campus Diaries can help one earn some decent amount of money and also get an idea of what the audience today likes to read. These sites are different from news sites or content writing sites which do not give any freedom of expression to the writer. Apart from these today-written-tomorrow-published techniques, actual writers dream of making it big in the world. They dream of the Man Booker Prize or the like. Even for well-written manuscripts there is a world of struggle out there. One can again start from smaller avenues like approaching magazines like Readers’ Digest or Chicken Soup for the Soul books. Short stories generally find place here. Certain publishers like Power or Zorba present packages as low as Rs 8000 for self-publishing. They print 20 copies of your book but without any editing. Editing and more sophisticated layouts require more investment by the writer. It may be a risk but then 50 Shades was a self-publication. And it turned out to be a best seller so the investment does pay off at times. Or if one likes the feel of having his or her name on a book cover in the bookstore nearby, it’s a good idea to go for such deals. Other budding publishers like Rupa or Srishti publish selected works and sell your book for as low as Rs 100. Many Indian authors have established their names through these previously unknown publishers. Ravinder Singh, author of I Too Had a Love Story is one such example. Even though it is difficult to make a living out of self-publishing, there is no limit to the marketing creativity. One can ask bloggers to review the book or set up YouTube or Facebook pages. One of the world’s leading publishers is Penguin and they accept sample chapters by mail. If they like your work, they talk business. They respond within their concerted three months limit. Pothi.com prints even one book at a reasonable cost thus reducing or eliminating the need to invest in bulk printing and storage of copies. So just sit down, get that pen and paper (laptop) ready and begin writing! Once the manuscript seems good to you, it can easily find a place in the wide world of books out there. Surbhi is a down-to-earth person who is passionate about writing and travelling. 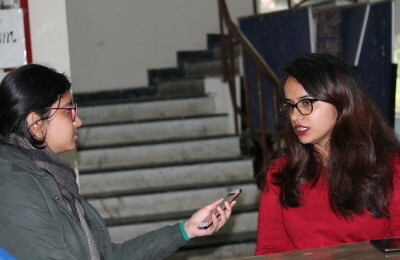 Currently a student of Hindu College, she wants to be a pilot and see every nook and corner of the world. From really bad PJs to her obsession with ET and Snowy, one experiences totally craziness with her. She has an adventurous bucket list which includes a ‘been-there-done-that’ tick on cliff diving and bungee jumping already!